There seems to be a lot of confusion around about high fructose corn syrup. Some health experts vilify it, while commercials (especially those made by the corn growers of America) say it’s no big deal. So what’s the truth behind all the controversy? First, let’s take a look at what it is. 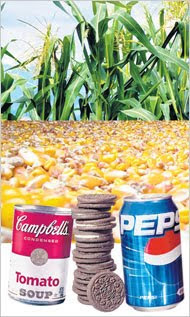 HFCS (high fructose corn syrup) is made by converting glucose in corn starch into fructose (both types of sugar, FYI). The resulting mix of fructose and glucose acts as a preservative (extending the shelf life of products) and is cheaper than plain, old fashion table sugar (sucrose). This is why so many companies opt to use HFCS over regular sugar. The problem occurs when people eat and drink too many products made with HFCS. Not because HFCS is inherently bad for you (it’s no transfats! ), but because, like sugar, it is high in calories and low in nutritional value. If you are eating a lot of HFCS, it probably means you are eating a lot of processed foods and drinking a lot of sweetened soft drinks and juices. It also probably means you are at least a little bit overweight and not getting all the nutrition your body needs. There is also some research showing that fructose is converted to fat more quickly in the body than glucose. Unlike glucose, fructose does not increase insulin or leptin production, and it does not suppress ghrelin (translation: Fructose does not decrease hunger when you eat it). Want the benefits of fruit? Eat a piece of the real thing, rather than drinking juice. It will help fill you up, thanks to the fiber. Hey this is a great article. I’m going to email this to my friends. I stumbled on this while surfing for some free lyrics, I’ll be sure to come back. thanks for sharing.